It is possible to identify forceful exertions by observing the job or examining the work methods analysis. Each step of the method is inspected to identify exertions with the upper limb. 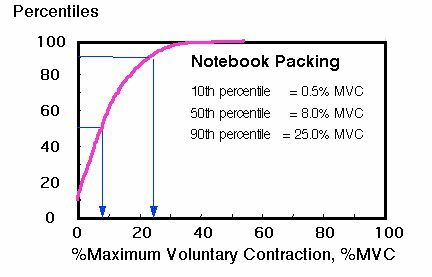 Example: Notebook Packing (see Figure 1). It can be seen that a force must be exerted with the shoulder to "reach," "grasp," and "move" the bottle. A similar analysis can be used to identify the forces and moments on the elbow, wrist and hand. Factors affecting the force of exertion are listed in Table 1. Often it is possible to rank exertion force based on an analysis of task attributes. For example, it can also be seen that greater force is required to "move" the bottle than to "reach" and "grasp" the bottle. Similarly it can be anticipated that transfer of a 12oz bottle requires less force than a 1 gal jug. Factors affecting force of exertion are listed in Table 6.6. Table 1: Factors relating to force of exertion for manual tasks. used force ratings to determine acceptable weights for tools used in an automobile trim department. The results are shown in Figure 1. Nearly all of the tools with masses less than 1.5 Kg were rated as "Just Right," while nearly all tools with masses greater than 2.25 Kg were rated as "Too Heavy." Figure 1: Ratings of tool weight by 23 subjects using 32 hand tools in automobile trim plant. (from: Armstrong, et al., 1989). Similar techniques were used by Drury (1980) and Pheasant and O'Neil (1975) to evaluate handle sizes. Force is an index of the effort exterted get, hold, or use a work object or to support the weight of the body. Both averate and peak forces should be assessed. 15% is considered the maximum force that can be exerted for a prolonged period without exhaustion. Higher forces may be exerted for shorter periods of time. Both average and peak forces should be rated. Force can be assess from observations of the worker and from consideration of task factors. Enough force must be exerted to keep objects from slipping from the fingers. 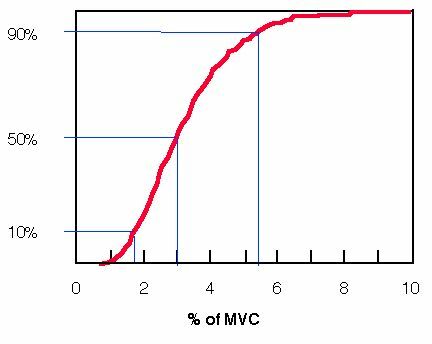 Pinch force, Fp, required to overcome gravity is related to weight and the coefficient of friction, m, as shown in Figure 6.9 (Armstrong 1985; Buchholz, Frederick and Armstrong, 1988; Bobjer, Johansson and Piguet 1993): Fp > Weight / (2 x m) --- see Table 6.7 for coefficient of friction, m. Some people exert considerably more than the minimum force to keep objects from slipping from their hand. Figure 3: The pinch force, Fp, required to support an object, W, is related to both the weight and friction, µ, of the object. The required pinch force increases as the skin dries! Johansson and Westling (1984) and Frederick (1990) demonstrated that the force exerted to lift an object with the fingers is related to weight and friction, but there is significant inter-subject variability (Figure 3). Exertion forces sometimes can be measured by placing the work on a force gage or attaching force sensitive materials to the work object. Instrumentation for measuring force may require expensive equipment and considerable expertise. Armstrong et al. (1991) utilized force transducers under keyboards to estimate finger forces exerted by keyboard operators as shown in Figure 4a. Figure 4b. shows the average force exerted on the "e" key by ten subjects while typing. It can be seen that the subjects exert more force on Kb3 than Kb2. Figure 5: Finger forces on keys are estimated from transducers that measure reaction forces under the keyboard, a. Key force-displacement curves for three keyboards, b. Average recordings for multiple "e" keystrokes by ten subjects are shown in c. (from: Armstronget al 1994). Electromyography is the measurement of electrical potentials produced by contracting muscles. 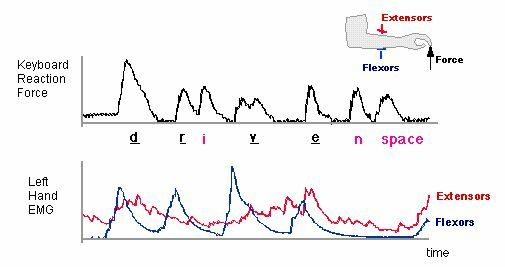 Electromyograms or EMGs are generally expressed as a root mean square, RMS. The EMG can be calibrated by recording the surface EMGs over the forearm finger flexor muscles for corresponding grip forces (see Figure 5a and b). 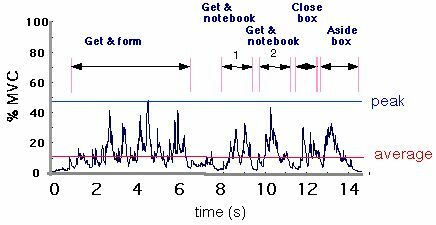 The force exerted during a work task can then be estimated by recording the EMG as the subject works. The system must be calibrated each time for each subject and each hand posture. Use of Electromyography to estimate hand forces was demonstrated by Armstrong et al. (1982) --- see Figure 5a and b.
Jonsson B. Quantitative electromyographic evaluation of muscular load during work. Scand. J. Rehab. Med. 1978; Supplement 6: 69-74. Jonsson B. The static load component in muscle work. Europ. J. Appl. Phys. 1988; 57: 305-310.
b Figure 6: Electromyograms or EMGs must be calibrated by recording surface potentials over the contracting muscles, a, while exerting known forces, b.
b Figure 7: Sample EMG recordings associated with getting and erecting cases, packing cases, and closing and asiding cases, a. Amplitude probability distribution (cumulative histogram) for EMG data from case packing job, b.
b Figure 8: Sample EMG recordings and keyboard reaction forces associated with getting typing driven, a. Amplituded probility distribution (cumulative histogram) for alphanumeric typing.